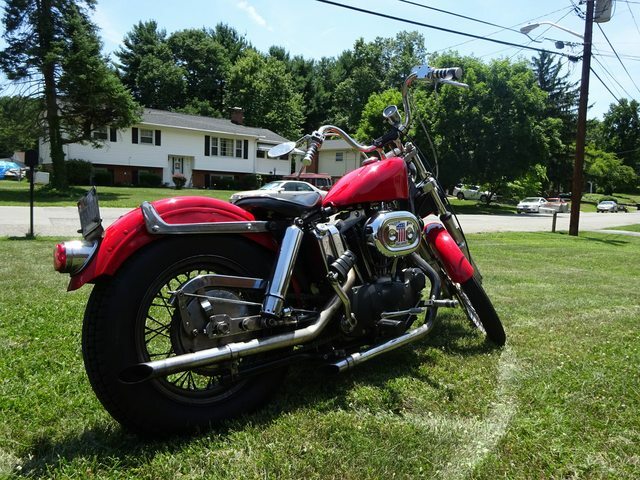 to everyone who currently is running big twin shocks on their ironhead (panhead/shovelhead shocks with covers, I would love to see some pictures of how low your bike sits. I am seeing different lengths of original shocks available. Looks like they range from 10" to 13.5". Thanks!!! I don't know the problem with the original poster's bike, but I like it a lot. So I figure I will continue to use this thread instead of creating a new one. I've been having trouble still with getting the ride height correct, while avoiding drive chain contact with the sprocket cover. I've decided to do what I had originally planned, and go hardtail. I am doing a bolt on though, which will help keep the bike's current look/balance. And because if I dont like it, I can always go back to a swing arm setup. I do have a question though. I just finished installing the rear wheel with the new hardtail bolted up. I noticed that with the axle installed, the bolt that keeps the drum cover from spinning isnt lining up correctly. Almost seems like I am missing a spacer or something. The drum cover is being pulled at an angle away from the bike, even though I should be able to use all the same hardware as before. I did a google search to look for info, because I wasn't sure if I somehow misplaced a spacer or something. Seems like everyone has a different way of attaching this bolt. About 50% of guys seem to be inserting the bolt with no outer washer so that the whole bolt is able to slide into the cutout on the frame. Other people, including myself, are using a washer between the outer frame and the bolt. The backing plate stop bolt needs to be shimmed so that when it is secured it does not alter the alignment of the shoes in the drum. If you bend the backing plate it will likely not be repairable and brake performance will suffer.